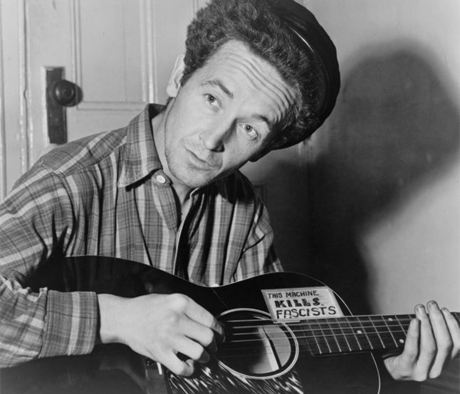 Iconic folksinger Woody Guthrie has received no shortage of tributes in recent years, with artists like Wilco, Feist, Billy Bragg, Tom Morello, Lou Reed and more revisiting some of the songwriter's works. Soon, Guthrie will be celebrated with a new archive and museum. The George Kaiser Family Foundation paid Guthrie's children $3 million for the archives, and it will be using the materials to build an exhibition in Tulsa, OK (close to Guthrie's hometown of Okemah, OK). The display will likely include the singer's personal notebooks and diaries, letters, artwork, unpublished stories and essays, lyrics, and various personal materials. Evidently the archives have been well kept. The New York Times reports that the museum won't be ready until at least 2013. In the meantime, the George Kaiser Family Foundation will be hosting a concert and a conference in March, 2012. This will coincide with the centennial of Guthrie's birth, which took place in July of 1912. This museum and archive will give some well-deserved recognition to Guthrie, who has often been ignored in his home state for his leftist leanings. He was only inducted into the Oklahoma Hall of Fame in 2006. Guthrie died in 1967 of Huntington's disease. He was 55.